August 3 – August 30, 2017, Mon-Sun. 3:30 PM – 7:00 PM or by appointment. Tine Kindermann has created an ongoing project titled We the People, after the 2016 election. 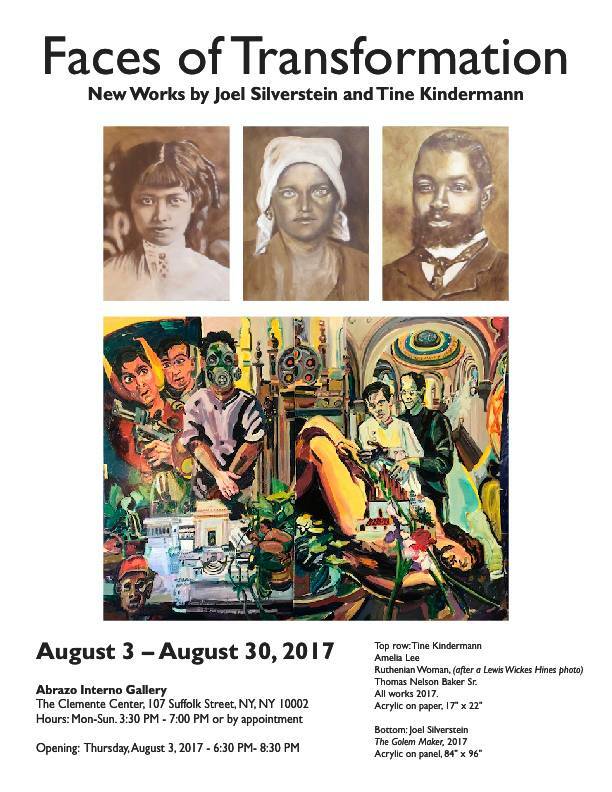 Working from vintage photographs, the artist examines the beauty and diversity of the American people, including immigrants, Native Americans and slaves. 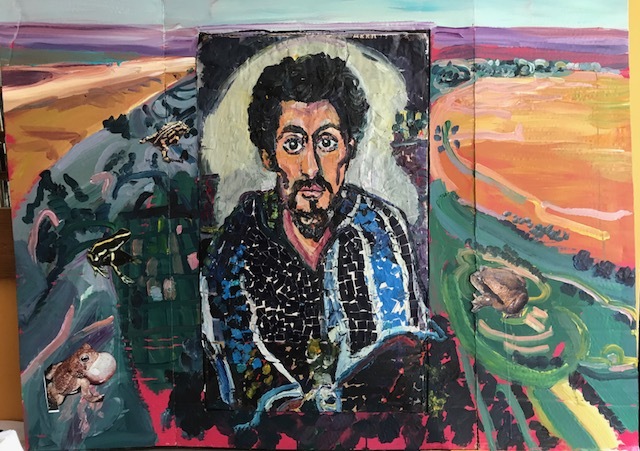 By translating photos into paintings, the artist connects her work to a tradition going as far back as the Coptic Fayum portraits of the First Century BCE, reflecting the universality of the human condition. Sources include the works of well-known photographers like Lewis Hine and Edward S Curtis, as well as family photos of friends and strangers alike. The body of this project consists of single- faced portraits, executed with acrylic paint on Kraft paper from the Satmar Shmura Matzo factory in Williamsburg Brooklyn, an immigrant business. In a series of large new works, Joel Silverstein has created a complex narrative called My Metaphysical Romance derived from film, superhero comics, pulp magazines, National Geographic photographs and the Hebrew Bible. In a Magic Realist style deriving from traditional early Twentieth Century figurative expressionism, Silverstein weaves complex dream imagery where all personal and historical time occurs in the same pictorial space. Layering saturated color, symbols and modes of representation, the artist loads his canvasses with imagery alluding to a speculative reality where all things are possible. Included in the show is a diptych entitled The Golem Maker, 2017 and a triptych dedicated to the writer HP Lovecraft, The Horror at Red Hook, 2017. Kindermann has defined the character of her subjects through her art. The weariness of past hardships, mixed with the defiance of hoping for a better future, personifies the sense of what it means to be an American today. For Silverstein, likeness and personality are proscribed by memory, dream and reflection, as well as the sense that there may be realities beyond what we know. Experience is a transformational process, embodied by gestural marks within the human form. Taken together, these artists create works which exemplify a palpable sense of being and becoming. The works confront each other in a bold way as if aware and cognizant, even as the viewer enters into a dialogue by viewing them. Tine Kindermann is a visual artist and musician from Berlin, Germany, who has been living and working in New York City since 1993. A figurative artist working in various media, her work, which includes miniature tableaux and dioramas, video and painting, has been shown at Stephen Romano Gallery, the Governors Island Art Fair, RePop, Mark Miller Gallery and other galleries in New York City, as well as Neurotitan Gallery and Gallery Kurt im Hirsch in Berlin. In the past two years she has co-curated exhibitions for Yiddish New York, an annual cultural festival in NYC. Tine has also sung German folk songs with Iggy Pop. Joel Silverstein is an artist, critic and teacher. He has earned a BFA and MPS from Pratt Institute and an MFA in Painting from Brooklyn College. He has shown work at Pratt Institute, Columbia University, the Van Leer Institute, The Mishkan Le’Omanut Museum, The Philadelphia Museum of Jewish Art. He has written over 60 articles and art catalogues. The artist/critic is a Founding and Executive Member of the Jewish Art Salon and has curated five Salon exhibitions including: JOMIX- Jewish Comics Art & Derivation and The Dura Europos Project. His work and curated exhibitions are both cited in Ori Z. Soltes’ book, Tradition and Transformation; Three Millennium of Jewish Art & Architecture, Canal Street Studios, NY, 2016. This seems like a very interesting exhibition. I would like to come to the opening, but since I work on West 83rd St, I’m not sure what is the best way to come to Suffolk St., either by subway or car? By subway: F Train to Delancey Street. Also the J M or Z Train. If you are coming from the A line, you can change for the F at West 4th.. By Car: You can drive down the West Side Highway all the way down to Washington Street and drive cross town to the LES on West Houston . You could also drive down the FDR to Grand Street. There is a parking lot off Delancey St right near the Williamsburg bridge as well as Municipal parking on Essex Street.